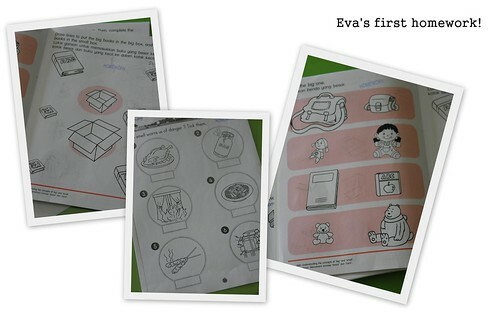 Home » Just Eva	» Eva’s first homework! During Eva’s first school year back in France, we never had to deal with homework. It’s a strange concept – homework for children around Eva’s age – mainly because they have so many activities to do at school and their teaching pedagogy borders more towards Montessori. How can you give homework for things like putting on your jacket or shoes, recognising your name, etc? When we were hunting for a school here for the kids, I wanted something that was more play-oriented than academic. My take on the matter is this – I want my children to understand that you can learn through play, that their childhood is only fleeting and more importantly, that academics isn’t to be all and all. Enjoying school, enjoying learning…that’s what’s important. I am afraid of killing any interest children have in learning so we kept this in mind when we went for school visits. After talking to a few people, we visited two kindies. The first wasn’t our cup of tea – Eva’s and mine, to be frank. In my opinion, it was sterile and very factory-like (read: heavy emphasis on outcome and results). Kids as young as 4 yo would have homework every day. School schedule was all learning and only one session of arts & crafts or play time. What ever happened to things like exercise, music, playing? There weren’t even story books in the library! The second, which we subsequently, settled for was far messier and older but Montessori-styled and looked more lively. There were story books, learning tools like blocks and beads, children’s work every where, play areas inside and outside and the schedule was much better. More importantly, they have a clear-cut policy – minimal homework, emphasis on soft skills and non-academic subjects too. I allowed Eva to choose between the two and she picked the second kindy that we went to. Till today, she keeps telling me that she enjoys kindy…even wonders why there isn’t any school on Saturdays! We started a while back and this is the first homework (if you could call this homework…kakakakak) she received – basically differentiating between sizes and discovering danger. She was proudly waving it around when I went to pick her up and agreed excitedly to working on her homework after her nap. Lets see how it goes later then! Teheheh.